Phoenix, Ariz. – Sep 19, 2017 – AFS Technologies, a leading global provider of software solutions purpose-built for consumer goods companies, is proud to announce that it has just launched its new microsite for its Distribution Management Systems line of software solutions focused on supply chain execution solutions. 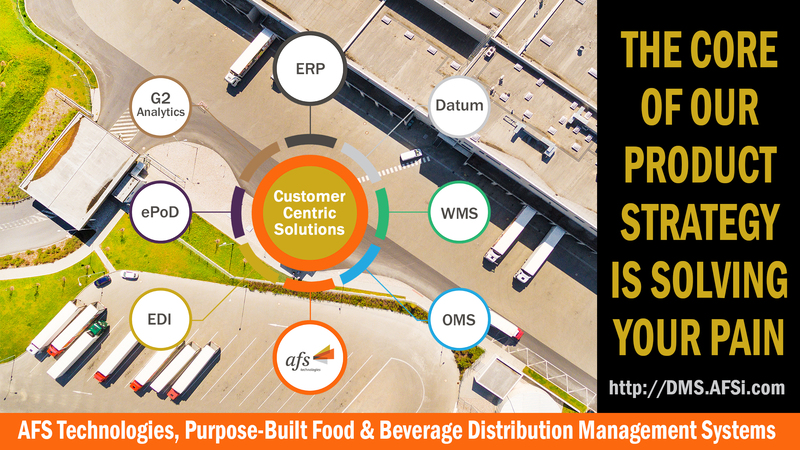 AFS is a leader in the Food & Beverage distribution software business, with Warehouse Management software, ERP software, Order Management software, Proof of Delivery and more. Founded over 31 years ago, AFS has been a consistent leader in providing ERP systems to the food and beverage distribution industry, growing its product portfolio and client base. With client relationships with the largest CPG companies in the world to its relationships with family run businesses, all of them count on AFS to be the best technology partner. The microsite brings together all the relevant distributor solutions within one area. It helps explain how they can work for you independently or how they easily integrate to further drive efficiency in your business. The microsite contains digital flipbooks for easy reading, fast minute videos, case studies and links to AFS specialists via its new “I am the Differentiator” campaign that highlights the tremendous talent that AFS employs, to develop, implement, manage, and support its solutions. Connecting with AFS has never been simpler and our goal is to be your best technology partner. Enterprise Resource Planning (ERP), Gain control and visibility across your operation by integrating your production, distribution, procurement, sales and financial processes with AFS™ ERP, including deals and rebates. Warehouse Management Systems (WMS), Improve inbound efficiency and accuracy through single-scan receiving. Eliminate physical inventory, monitor and enhance labor productivity, reduce labor expense and improve overall inventory accuracy. Comply with traceability initiatives, improve turns, reduce spoilage and drive mission critical warehouse controls with the highly scalable and feature-rich AFS WMS. Its Single-Scan Traceability, built into WMS, gives businesses the ability to have complete visibility into the origin, current location and destination of products, and in the event of a recall this can equate to saving lives–by getting products off supermarket shelves before contaminated product is purchased and consumed. As recalls become more frequent, handling them efficiently is beneficial to the business. Order Management Systems (OMS), Maximize your profitable sales potential, streamline the complexity of order processing, and synchronize intelligence across the entire sales organization and channels with the flexible, full-featured, highly scalable AFS™ OMS. G2 Analytics (G2) to gain deep and relevant insight to your business performance and uncover areas of opportunities across any set of business dimensions with the unique data discovery and visualization capabilities of AFS G2 Analytics with minimal IT support. Manage by Exception! Electronic Proof of Delivery (ePoD) – Improve your delivery process with increased accuracy, real-time communication, configurable work flow, track & trace to point of delivery and go green with AFS™ Electronic Proof of Delivery. DATUM – Product Master Data to Improve every functional area of the business by keeping your product master data files in sync with the manufacturers (GS1/GDSN). Sync up-to-date product attributes and provide a user-friendly interface to quickly view pertinent data with AFS™ Datum. AFS Technologies (AFS) is a leading provider of software solutions purpose-built for consumer goods companies. We are committed to generating improved outcomes at the point of purchase coupled with generating efficiencies in trade spend, retail execution and supply chain. With experience developed over its 31-year history, AFS serves more than 1,100 customers of all sizes in over 50 countries around the world. The AFS products are innovative, configurable solutions that are proven to optimize your potential with automated processes, improved productivity and rapid time to value.